I think all of us are looking for ways to look better, slow down the aging process, and improve our facial appearance. Recently, I read an interesting article in the Aesthetic Surgery Journal about the lines on your face and how they are influenced by the position in which you sleep. Wrinkles on our face are one of the most visible signs of aging. Most wrinkles are due to the inherent aging process of the skin, and the effect that the movement of our facial muscles has on the skin over time. When a muscle moves it creates a wrinkle in the overlying skin, usually at a right angle to the muscle. For example, let’s take the major forehead muscle: the Frontalis muscle. This muscle runs vertically, up and down our forehead as it raises our eyebrows. But as it moves, it bunches up the forehead skin making transverse lines that run from side to side. These wrinkles can be called “expression wrinkles”. “Sleep wrinkles,” as this author calls them, are not affected by muscle movement but by the position of our heads as we sleep. It is suggested that the forces of “stress,” “compression,” and “tension” can cause these lines. 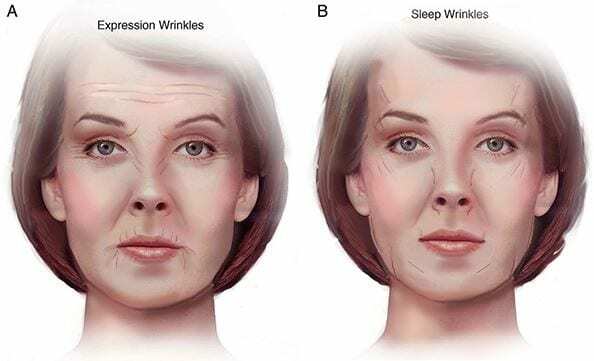 These lines occur in different locations on the face than the expression wrinkles, and it appears that these wrinkles occur when we are sleeping on our sides (lateral position), or on our stomach (prone position). Both types of wrinkles can be improved (although probably not eliminated) with surgery. Expression lines can frequently be prevented and minimized with the use of Botox to relax the muscles causing them. But what about sleep wrinkles? Well, simply sleep on your back. Easily done, right? Well, not quite. Did you know that the most common sleep position is lateral, or sleeping on our sides? We sleep in this position 65% of the time, we sleep on our backs (supine position) 30% of the time , and we sleep on our stomachs 5% of the time. So no worries, let’s just sleep on our backs. The problem here is that we change position an average of 20 times a night. There have been a few pillows developed (one by the author of this study), which will reduce pressure on our face when sleeping on our sides. However, it seems that these are uncomfortable and take quite a while to get used to. In terms of anti-aging, sleep is one of the most important things that we can do. So, something that interferes with your sleep may well be counter-productive to aging – sleep wrinkles aside. While we are on the subject of aging, there are many other things can we do to slow down the development of wrinkles. Probably the most important thing is sun protection. Very few external elements affect our face as much as the UV rays of the sun. So please, everybody, wear your sunscreen. Seriously. Smoking, too, has a profound effect on the appearance of the skin. Smoking releases what are known as free radicals, molecules that affect the ability of the skin to repair itself. They also slow down collagen and elastin synthesis. Studies have looked at the appearance of identical twins where one smoked and the other did not; The difference in aging is profound. Cigarette smoking also increases wrinkles around the mouth as you pucker your lips to take a drag, increasing the normal movement of the muscles. Drinking through a straw can do the same thing. Sleep on your back – if and when it is possible. Minimize drinking through a straw. For everything else, there’s….well, your friendly neighborhood plastic surgeon! PS: Here is the link to the article in the Aesthetic Surgery Journal if you’re interested.